Changers. Readers of the Byways books quickly discover that Ian Johns and his three sons aren’t typical. Not only do all three boys have different mothers (making them half-brothers), they’ve each inherited their father’s magical talent. As “Changers,” they can transform into an animal. Ewan’s animal form is an elk. Even when he Changes into his animal form, Ewan’s eyes remain amber … yet another Johns family trait. 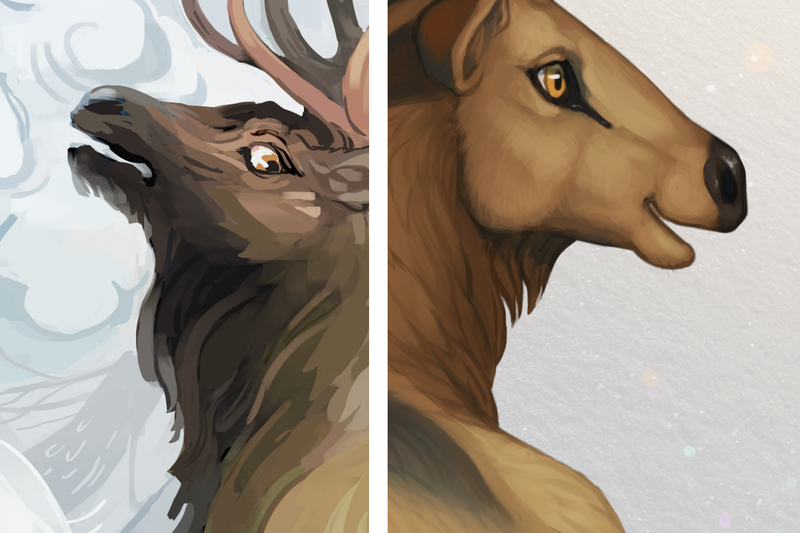 Close-ups of Ewan in elk form, the first from Hannah Christenson’s cover illustration for Book #5: Inside the Tree, and the second from a “Winter Trio” by Katie Hofgard. In both, Ewan’s eyes are amber. You can follow Ewan’s progress in the race across liberty in Book #2 [available now] and Book #5 [releases 5/26].